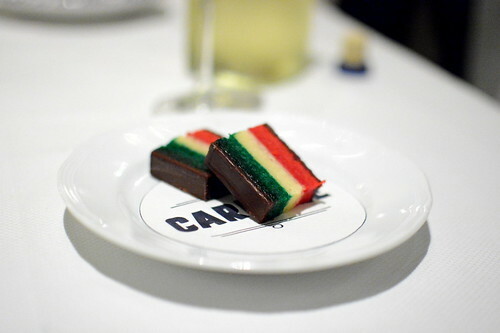 Of all the incredible restaurants on our Las Vegas dining itinerary, I was most excited for Carbone. 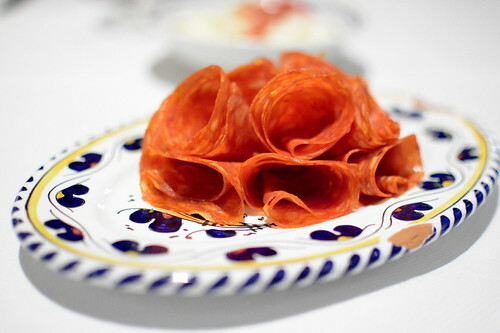 According the the restaurant’s website, “this celebrated concept from Mario Carbone, Rich Torrisi, and Jeff Zalaznick pays homage to the Italian-American restaurants of the mid-20th century – an era of glamour, showmanship and tableside service.” (See also: Parm). 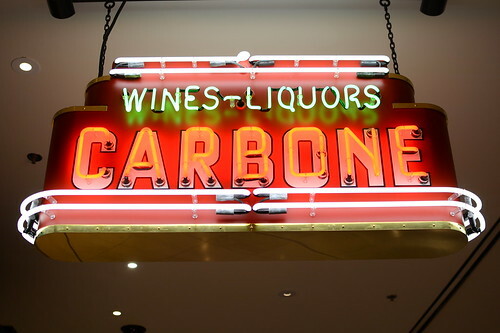 My brother has been raving about Carbone ever since it opened in New York, so I was beyond stoked to experience the Las Vegas iteration for myself. One day I’ll make it to the original outlet. From the moment we stepped into the restaurant, The Astronomer and I knew that we were in for a special evening. The main dining room boasted a chandelier dripping with crystals, while the waiters were outfitted in sharp crimson tuxes. 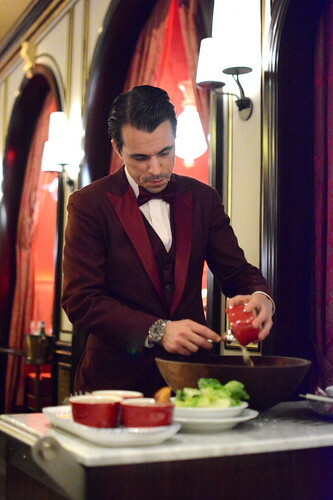 All around us were carts preparing various provisions—from Caesar salad to bananas Foster—tableside. 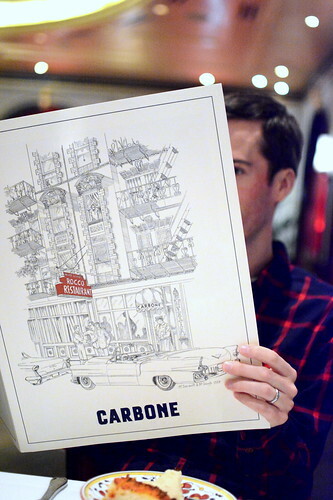 Dinner and a show is what Carbone is all about. Just about everything here is larger than life, including the menu. 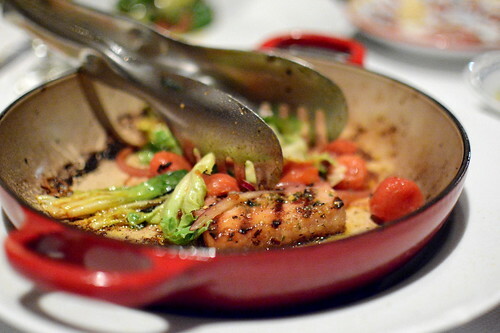 Ironically, the details provided for each dish are minimal, despite the real estate available. Our waiter captain was simply fantastic with filling in any blanks and offering solid recommendations. Dinner began with a series of complimentary appetizers. 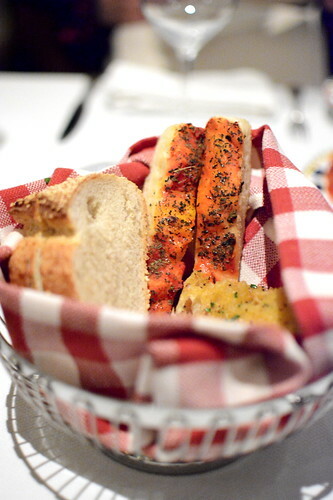 The bread basket included three varieties of the good stuff: “grandma bread”—a Sicilian pizza with oregano and tomato sauce, garlic bread, and seeded white bread. 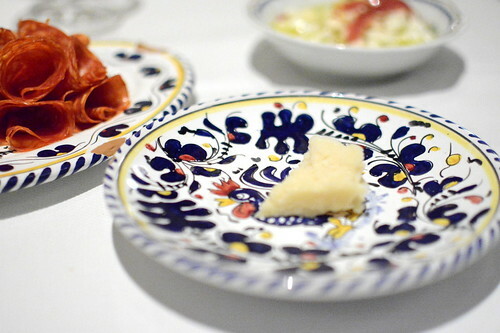 …and a hunk of Parmigiano Reggiano served from a hollowed-out wheel. Truth be told, it was damn near impossible not to fill up on freebies. 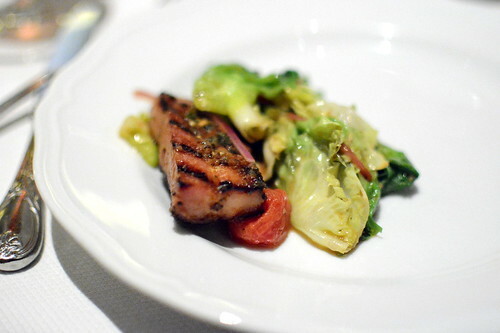 Our first official appetizer was the “Sizzling Pancetta”—thick slices of pork belly, cherry tomatoes, and escarole in an awesomely zesty Italian dressing. 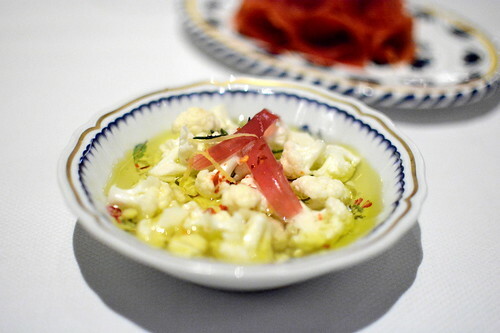 This starter came highly recommended from my brother and the captain and it did not disappoint. Pork belly dishes tend to hit a heavy and rich note, but this preparation had an unexpected brightness that was irresistible. We also shared the Carpaccio Piemontese, paper-thin slices of beef dressed in a truffle-tinged olive oil with chives, salt, mushrooms, and arugula. The dish was straightforward and solid. 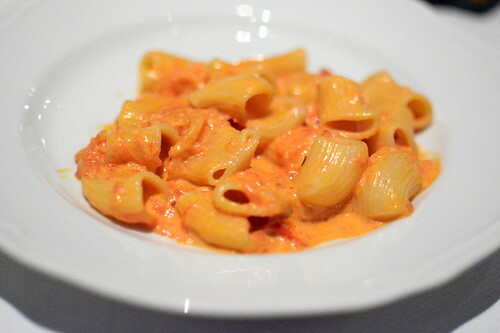 For the pasta portion of our meal, we couldn’t resist the “Spicy Rigatoni Vodka.” The vodka sauce, creamy, tangy, and just spicy enough, paired like a dream with the tubular noodles. It’s no wonder that it’s the most popular pasta on the menu. 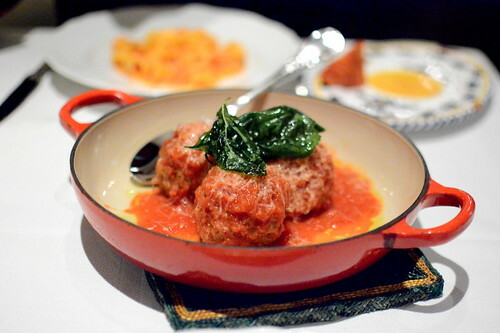 At the suggestion of the captain, we paired the pasta with the off-menu meatballs, which were served in a bright tomato sauce and topped with fried basil leaves. 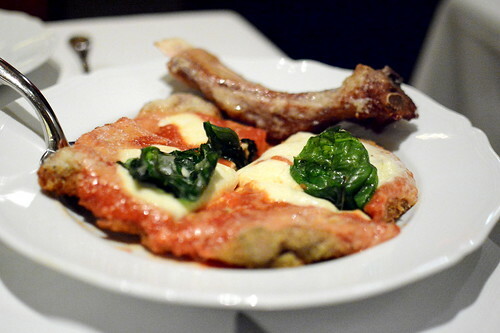 The only disappointing dish this evening was the “Veal Parmesan,” which was as bland as can be. The bone, however, was worthy of gnawing. 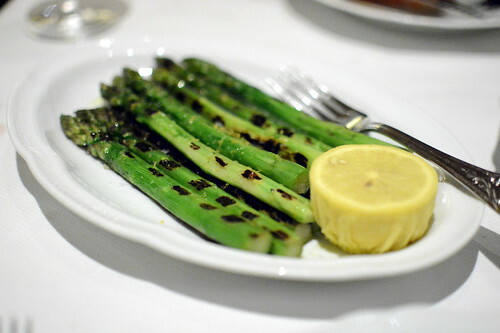 To round out our meal, a side of grilled asparagus with fresh lemon. 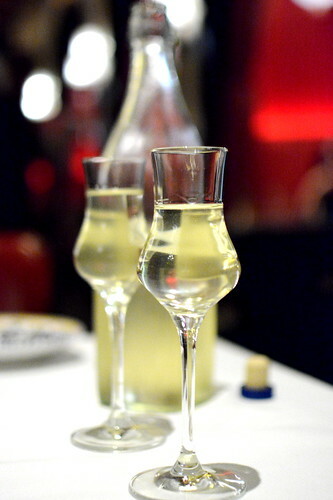 Complimentary limocello transitioned us from savories to sweet. 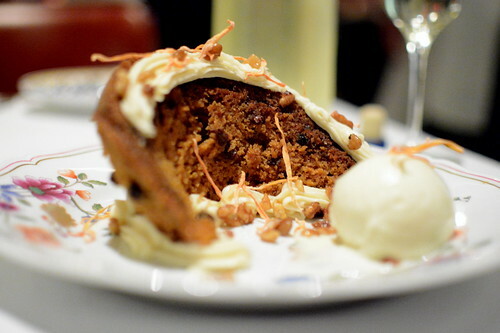 While I desired the bananas Foster for dessert, we settled on carrot cake because The Astronomer isn’t a banana fan. The cake was very, very good—super moist and not too sweet. And last but not least, Italian flag cookies to finish. Dinner at Carbone was simply excellent. The ambiance and service were awesomely theatrical, yet not so over-the-top that they out-shined the cooking. The experience was so charming that even the skeptical Italian couple seated next to us was won over by evening’s end. Carbone: get here. that flag cookie is so cute!